Kansas performance artist and photographer Jaimie Warren has totally raised the selfies stakes. Working to create elaborate homemade sets and costumes to rework art from Ancient Egypt to William-Adolphe Bouguereau to Easy E, she is in the middle of a show at New York's fantastic Hole gallery. Taking elements from Dada, Tumblr culture, the homely DIY of the midwest, feminism and pop / high culture, she's forming a new language of represantion with a healthy dose of deep LOLs. We're pumped to show off a never-before-displayed-in-full set of photos from this fantastic artist, together with her description of the work, and encourage all New York readers to attend her talk on 6th, at the Hole in the Bowery. I have been taking self-portraits for the past 10 years, and though the past images have focused on low-budget costuming and inserting myself awkwardly into various subcultures in the Midwest, India and Japan, this new series is the result of a new fondness for creating sets, props and costuming. I am the co-director/co-creator of a traveling variety show for kids and adults called “Whoop Dee Doo”. For my newest series of images I have been working with Lee Heinemann, who has been with Whoop Dee Doo since the age of 15. Lee creates custom masks, wigs and props for these images. These images are all direct references from sourced photo-shopped collages found on the Internet, often made from anonymous users. 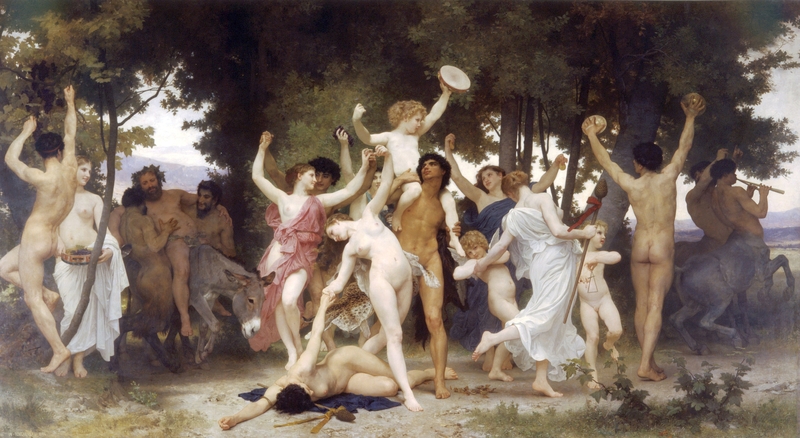 The first series are from famous paintings from art history – predominantly by William-Adolphe Bouguereau – that have been altered, most often with elements from contemporary culture. There are dozens of websites dedicated to entertaining people who are “bored at work”, which is where I have found these. The second series is sourced from the websites creating morphed images of “celebrities as food”. And the third series are re-creations from totallylookslike.com, where thousands of users make visual pairings – most often pairing images of celebrities with images of animals, food, objects, or other celebrities. In all of these images, I am playing every character – from Rod Stewart and Lil’ Kim to Santa, Yoda, and an artichoke.